Today Techland announced the final touches are being put on a tie-in novel based on the upcoming action survival game Dying Light. Titled Dying Light: Nightmare Row, the novel will be a prequel to the events depicted in the game, taking the reader to the days prior to the outbreak that decimated the city of Harran. 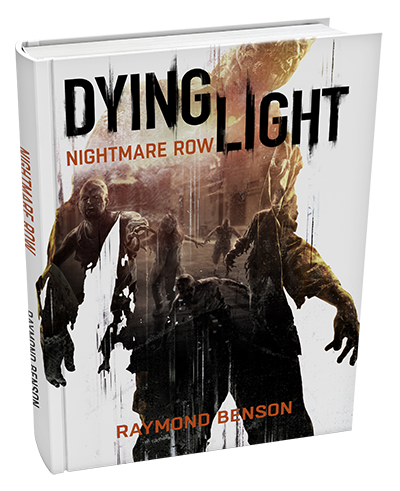 Dying Light: Nightmare Row is written by Raymond Benson, the author of over thirty published titles, including the official follow-up James Bond novels commissioned by the Ian Fleming Estate. Dying Light: Nightmare Row tells the terrifying story of Mel Wyatt, an 18-year-old American athlete who participated in the Harran 2015 Global Athletic Games two weeks earlier. As one of many Americans stranded in Harran as a result of the outbreak, Mel has been surviving with her little brother, Paul, in an isolated hotel – their parents were killed on the first day of the Infected attacks on the stadium. Thus begins a tense and ticking time bomb thriller of survival. More details about Dying Light: Nightmare Row, including price and release date, will be announced soon. Dying Light (videogame) is coming to PlayStation 4, Xbox One, and the PC, and is scheduled for release in 2015 on January 27th in the Americas, January 28th in Asia, Australia and New Zealand, and January 30th in Europe. Joymax has announced their Easter event for Digimon Masters Online has been released, and will continue until April 9. MapleStory fans will soon have a new adventure to embark on, as the MapleStory M beta has been announced.